Working on vehicles all day long does not have to be back breaking work. Having a high quality, powerful lift can take a lot of the strain and effort out of performing maintenance and repairs. However, finding the right lift for your garage or shop can be a daunting task. If you are ready to make the investment in a two post lift but are not sure where to look, let us help you get the information you need to narrow down your options. Our two post car lift buying guide will start you on the right track toward having a lift you love, helping you make the most of your time so you can get work done easier and quicker every day. The first thing to consider when looking at two post lifts is whether or not you want a lift with an overhead or baseplate design. Two post lifts operate by using two posts to hoist a platform that lifts the vehicle into the air. With an overhead style, a beam connects the posts at the top, providing a good amount of stability and support while taking up a relatively small amount of space, giving you plenty of room to work and open access to the vehicle. With the baseplate design, a larger plate beneath the vehicle can deny proper access to the vehicle, making it difficult to use accessories such as tall stand supports or a transmission jack. At the same time, baseplate designs have shorter constructions, making them easier to fit in garages with low ceilings. You should also think about whether you will use symmetrical or asymmetrical designs. Asymmetrical is the typical choice, having front arms that are shorter than the rears. This allows for the driver to place a smaller amount of the vehicle ahead of the posts, leaving more room to open the door and making the entire process easier. In addition, they allow for the posts to be placed closer together to conserve space. 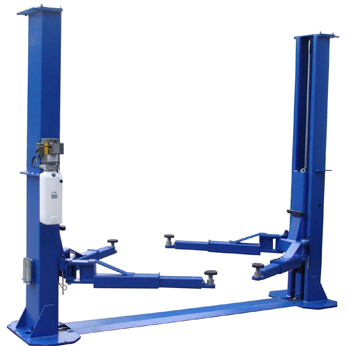 Symmetrical lifts were designed for use with heavier trucks, SUVs, and other larger vehicles, and are a great option if you regularly work on this type of car due to their great level of support. These larger vehicles also have doors closer to the front, relatively, and therefore are easier to get in and out of using a symmetrical lift. The primary things to consider beyond the simple design of your lift are price and space. Ensure you have the proper support in your shop to handle the installation of a powerful lift so that you get the performance you expect and can work safely and confidently. In addition, keep in mind the range of vehicles you want to perform work on. Lifts that can handle more weight will often end up being more expensive, but you should be well prepared for any vehicle that drives up to your garage. Opt for more weight than you expect you will need so that you can handle any situation without worry. Ordering used lifts might also be tempting to keep costs down, but keep in mind that lifts are large pieces of equipment that require maintenance and repairs themselves. You might save money in the long run by having a high quality, brand new lift that will last for years to come.